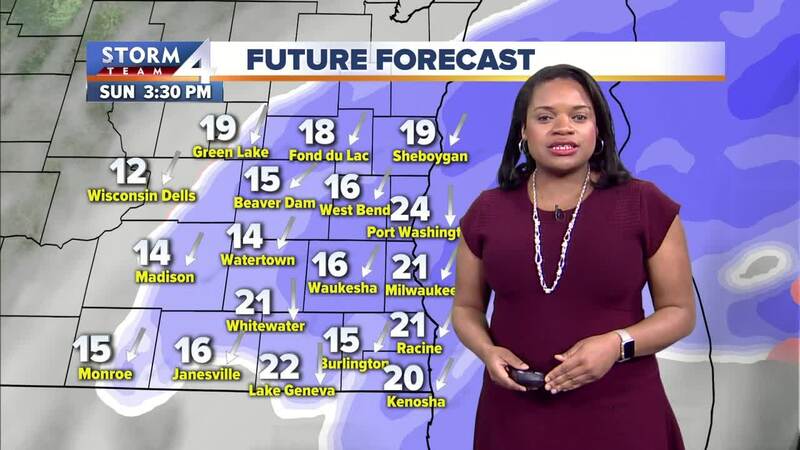 From Milwaukee to Kenosha 1-3” of snow will be possible. Another round of April snow is on the way for our Sunday. Between 7am-10am, wet snow will begin to fall across SE Wisconsin making slushy conditions on the roadways. From Milwaukee to Kenosha 1-3” of snow will be possible; farther west expect a trace to 2” with highs in the mid to upper 30s. Snow showers will start to taper off around 9pm. The overnight will be cloudy and breezy with lows in the upper 20s. Monday will start out mostly sunny then we’ll see increasing clouds in the afternoon with highs in the upper 40s. Tuesday will be mostly cloudy and warmer with highs near 60°. Wednesday through Friday we'll stay in fairly unsettled weather pattern as another potent low pressure system moves across the Plains bringing the chance for more showers and thunderstorms to SE Wisconsin. Expect showers throughout the day on Wednesday with highs in the lows to mid 50s. TODAY: Cloudy with snow. Accumulation: 1-3”. High: 37. Wind: NE 10-20 Gusts: 30 mph. TONIGHT: Snow ending then mostly cloudy & breezy. Low: 28. Wind: N 10-15 mph. MONDAY: Partly cloudy. High: 48. TUESDAY: Mostly cloudy. High: 60. WEDNESDAY: Showers likely. High: 54. THURSDAY: Sct. showers & thunderstorms. High: 60.